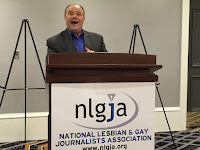 SAN FRANCISCO — Hundreds of LGBT news industry professionals and allies attended the National Lesbian & Gay Journalists Association’s (NLGJA) annual convention and 11th LGBT Media Summit, a four-day gathering held this year over the Labor Day weekend in San Francisco at the Westin St. Francis. This is the organization’s silver anniversary. The theme of this year’s gathering was Coming Home, a reference to the founding of the organization in 1990 in the Bay Area by the late Leroy F. Aarons, an openly gay pioneering journalist, editor and author. During the main convention, attendees heard keynote speakers, panelists, and workshop leaders address a variety of topics, including the LGBT movement after marriage equality, freelancing, social media trends, transgender coverage and being out in broadcast media. The one-day summit focusing solely on LGBT media featured two plenary sessions, one on faith and LGBT youth and another on misgendering in the news. 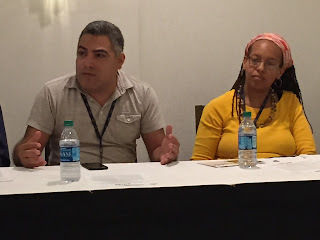 Other panels focused on HIV/AIDS coverage in LGBT media and AIDS specific media, documentary journalism with filmmakers, transgender children coming out, journalism and activism, journalists as authors and the history of LGBT media. At the end of the day, CNN's Richard Quest interviewed The Weather Channel's Sam Champion on stage for the opening night reception, Sept. 3. 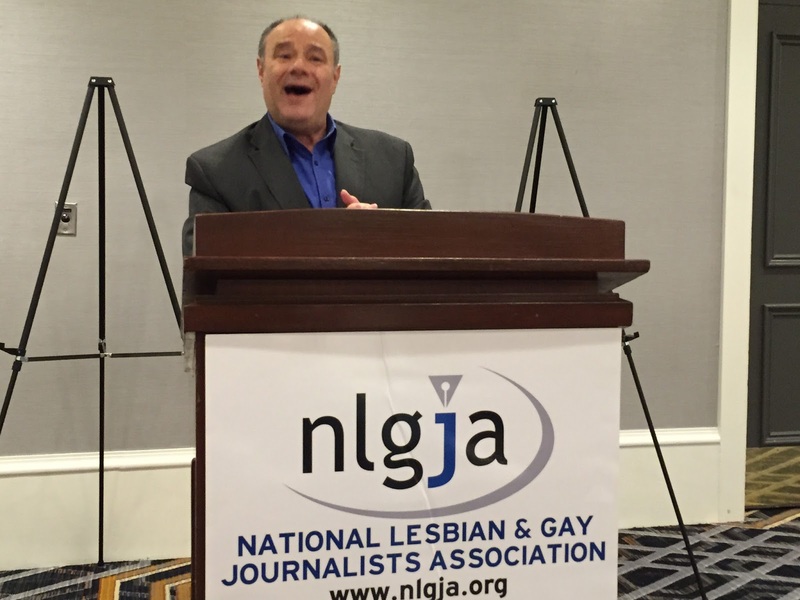 Windy City Times publisher and executive editor Tracy Baim, co-chair of the LGBT Media Summit, was pleased with the day’s proceedings. Windy City Times provided photo and video coverage of the summit and convention, along with a news story at http://www.windycitymediagroup.com/lgbt/NLGJA-25-kicks-off-Quest-interviews-Champion-/52700.html. 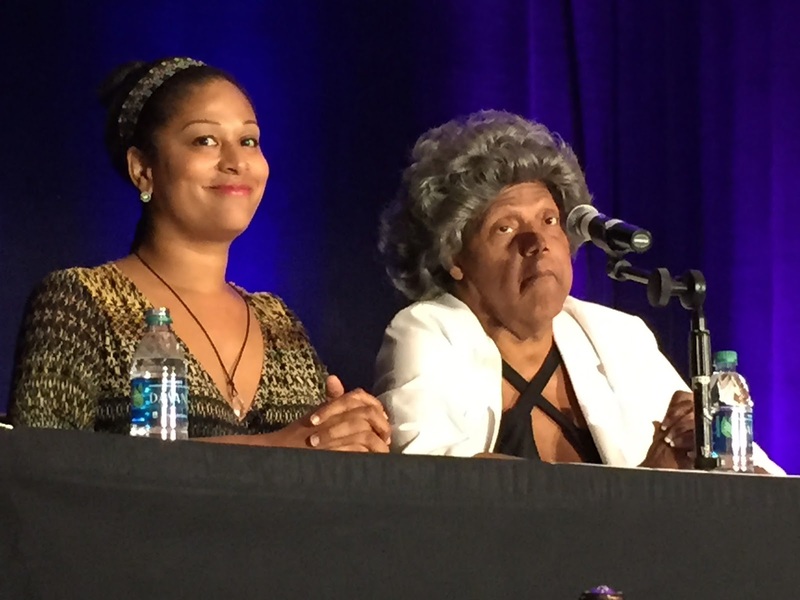 The Media Summit luncheon plenary featured a panel of trans elders, including Miss Major Griffin-Gracy, Veronika Fimbres and Jamison Green, Ph.D., who discussed misgendering of transgender people in the news, culture and Hollywood. Examples of misgendering include the use of improper pronouns, abandoned names and sensationalized gender stereotypes. "Misgendering trans people is akin to bullying LGB people," said moderator Ashley Love, a transgender advocate. Fimbres said, “Misgendering is the wrong calling of a person’s gender at the wrong time by the wrong people who don’t know what they are talking about. I think there is a rush to label people so quickly that the press, especially, has a tendency to rush to say things about somebody because they don’t want somebody else to break the story before them, which has a tendency to get something in the paper. It doesn’t matter what. It could be wrong, but they can prove it wrong later. Possibly and a lot of times, the police and people who cover trans murders or trans anything are misgendering and giving misinformation. And so we need to be a little slow and wait and see before we start calling people out for what they are or what we think they are. Griffin-Gracy is a veteran of the Stonewall Rebellion. In fact, the upcoming movie “Stonewall,” became an example of the culture and Hollywood “whitewashing” history by portraying the story of Stonewall through the eyes of a white man, rather than the trans people and people of color who actually fought back against the police on that pivotal night in 1969 that launched the modern gay rights movement. Another controversial topic was Caitlyn Jenner, who panelists agreed did not represent the totality of trans people’s lives. After much discussion of Jenner and “Stonewall,” Griffin-Gracy had had enough. She apologized, but left the room before the discussion was over. For fuller reporting of the plenary, see Liz Highleyman's piece in Bay Area Reporter at http://www.ebar.com/news/article.php?sec=news&article=70886. The LGBT Media Summit’s opening plenary, “Faith, Family, and Futures for LGBT Youth,” was moderated by Cathy Renna and featured Rabbi Debra Kolodny; Mitch Mayne, an openly gay Mormon active in his church; Dr. Caitlin Ryan, founder of the Family Acceptance Project; and Holly Montgomery, a Mormon mother of gay son. Renna is a senior executive vice president at Target Cue, LLC, a consultancy that specializes in providing public relations and marketing communications services to not-for-profit organizations seeking to reach highly-defined audiences. The other stories Mayne heard were from parents of LGBT Mormon youth. Wendy Montgomery shared her experience when her 13-year-old son came out. Mayne and Montgomery credited Ryan’s groundbreaking Family Acceptance Project — a research, intervention, education and policy initiative that works to prevent health and mental health risks for LGBT children and youth — for their efforts to reconcile faith and family. In her remarks, Ryan spoke to the risks of suicide, self-medication, drug abuse and risky sexual behavior. For her part, Kolodny said that studies show bisexual youth have the highest rate of suicide attempts, highest substance abuse and highest incidence of lack of family support. And yet, she said, the landscape of various faith communities over the last 50 years shows real change for the better, with more and more denominations welcoming LGBTs. One panel focused HIV and AIDS coverage, specially in LGBT and AIDS media. This was a followup to a panel at last year’s convention about media coverage of HIV/AIDS. and HIV Coverage in LGBT and AIDS-specific media"
Moderator Diane Anderson-Minshall, editor-at-large of The Advocate and editor-in-chief of Plus magazine, presented a style guide put together by Plus magazine regarding words and terms related to HIV/AIDS. The full style guide is available at http://www.nlgja.org/wp-content/uploads/2015/03/HIV-Plus-Style-Guide-2015.pdf. 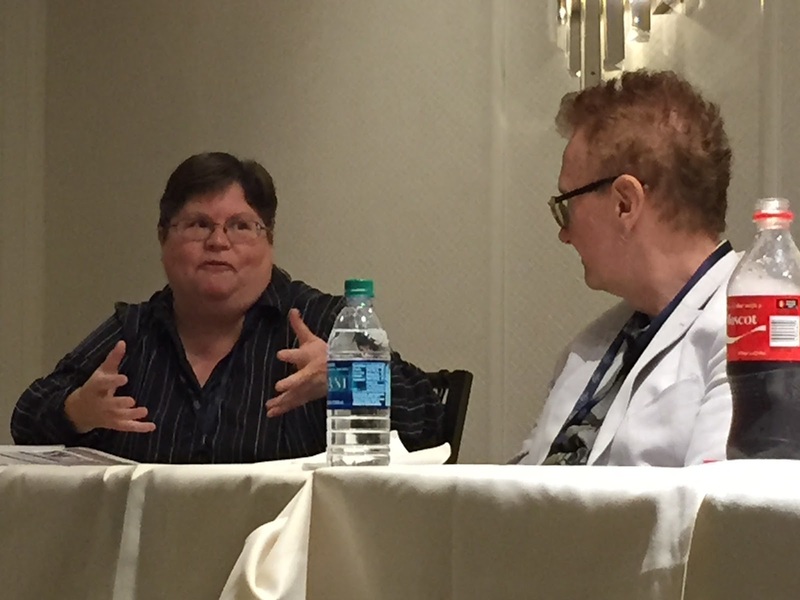 Yet another summit panel focused on the history of LGBT media. Mike Flannagan, who writes a history column for San Francisco’s Bay Area Reporter, spoke to the difference between mainstream and LGBT media. 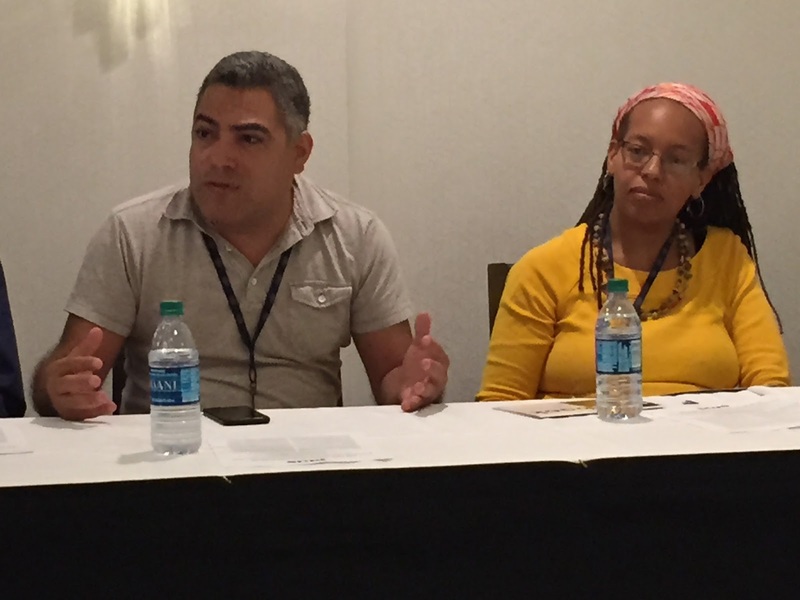 Panelist and publisher Baim spoke to the business side of LGBT media vis-à-vis mainstream outlets. Advertising needs to be in both mainstream and LGBT media, Baim said. During the convention’s Authors’ Cafe, Baim also spoke about her new book, “Barbara Gittings: Gay Pioneer.” It is the first full-length biography of the woman often referred to as the mother of the gay-rights movement. This is Baim’s 11th book on LGBT history. Mark Segal, publisher of Philadelphia Gay News, also spoke at the Authors’ Cafe, telling stories from his new memoir, “And Then I Danced: Travelling The Road to LGBT Equality.” Among the stories he chronicled in the book, Segal spoke of his protest against and ultimate friendship with CBS news anchor Walter Cronkite. Segal’s book comes out in October. For Tammye Nash, managing editor of Dallas Voice, this was her third convention as an attendee. “There has always been a dichotomy at these conventions between those of us working in the LGBT media and LGBT journalists in mainstream media,” she said in email correspondence after the conference had ended. “A lot of the issues we deal with are the same, of course, but there are so many things that are different. 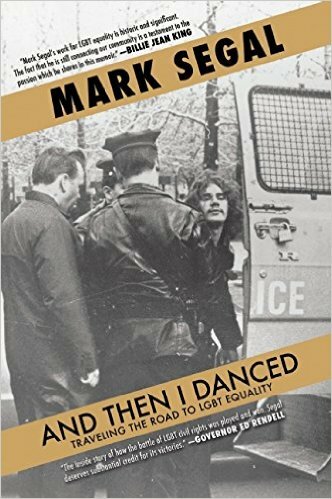 “rather than the trans people and people of color who actually fought back against the police on that pivotal night in 1969 that launched the modern gay rights movement”: Not a single phrase of that statement is factually true.